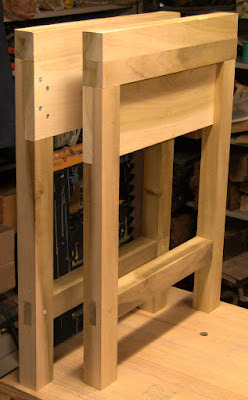 For the intro hand tools class I'll be teaching in October, I'm building two portable workbenches. These are from Roy Underhill's The Woodwright's Apprentice . It also appears in Bernard E. Jones' The Practical Woodworker from 1918. The two benches will be a few inches different in height to accommodate different students. Roy makes it from full thickness pine 2x10. Since that's virtually impossible to find, I got some gorgeous 2x10 nominal thickness poplar from The Woodery. 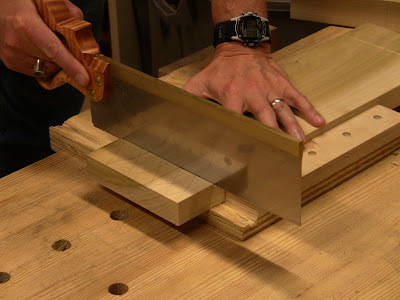 The top is just a simple slab and tool well. 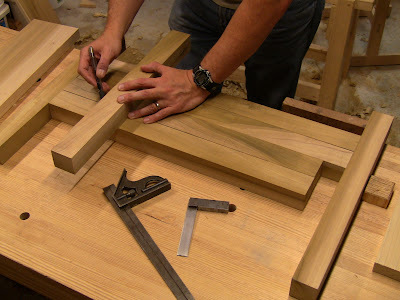 The leg assemblies are made from 2x2's with half-lap joints for the 5/4x6 upper rails and drawbored mortise-and-tenon joints for the 2x2 lower rails. They attach to battens under the top with hinges to fold down roughly flat. 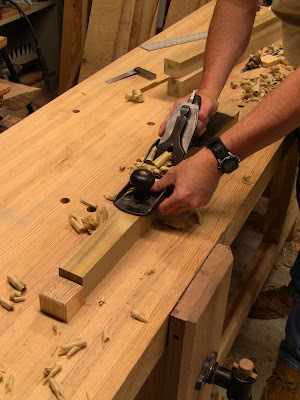 A large stationary workbench like a Roubo relies on massive timbers and beefy joints to resist the forces of planing. This bench relies on the mighty triangle, the shape that made iron trusswork possible. 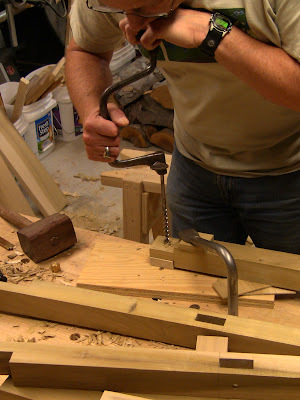 Two cross-braces swing down from the middle to bolt to the lower rails in the leg assemblies, forming two triangles. From a mechanical engineering standpoint, the triangle forms a rigid structure; push on any point and it maintains its shape. For a square or any higher order polygon, pushing on any member or joint will deform the shape. Ripping one of the slabs into 2" widths for the leg pieces. Jointing the slab to re-establish the edge. ...and flatness. Keeping it that way is easier than correcting it if you go off. 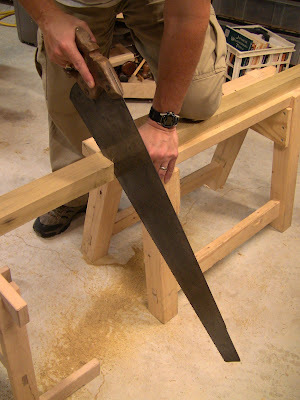 I had recently replied to a post on Sawmill Creek saying that you could probably rip 2" stock at about a foot per minute with a good saw. This project was a good time to put that to the test, so I timed my rips. My first three took 22, 24, and 22 minutes for a six-foot length, nearly 4 minutes per foot. Not quite what I had expected; I decided to sharpen the saw. Taking 10 minutes to sharpen the ripsaw. This is a Thomas Preston 6 TPI, somewhere between 100 and 150 years old. The result of the fourth rip from the same board: 7 and a half minutes. Think about that for a moment. Sharpening the saw reduced a 22-minute operation to 7 and a half minutes. That's a minute and a quarter per foot, within spitting distance of what I had said. There's just no substitute for a sharp tool. So the moral is, if you think you need to sharpen, sharpen. It's time well spent. 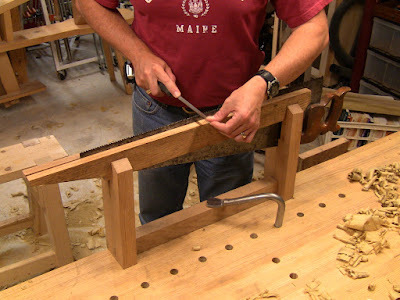 My one deviation from the design was to add a spacer to the batten on one leg assembly, so that the legs will fold flatter. This needed to be square in cross-section. Using the cambered jack to reduce the spacer width to match the thickness. Big heavy curls down the length and on the diagonal. Fine curls jointing it smooth. Marking across all four legs for length. Two longer legs above, two shorter below offset by the spacer. Cutting the legs to length completed all the cutting and sizing. 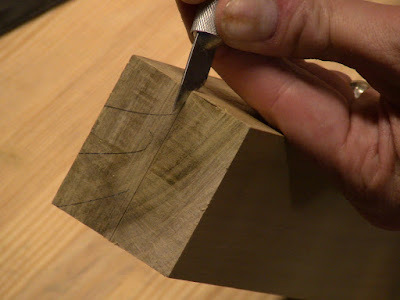 Next step was to mark for the joinery. 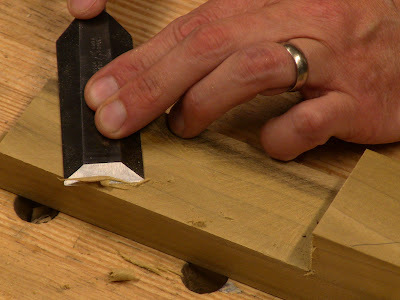 Marking for the upper rail half-laps, without the spacer in place. 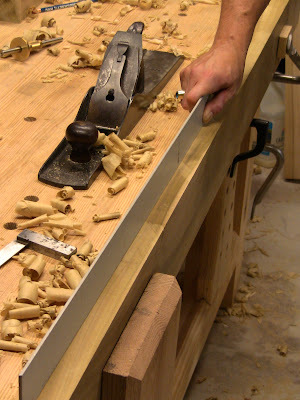 Marking for the lower rail mortises. 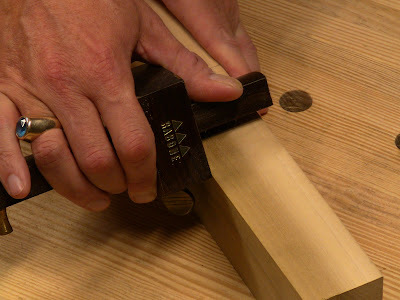 Gauging a leg for a mortise. 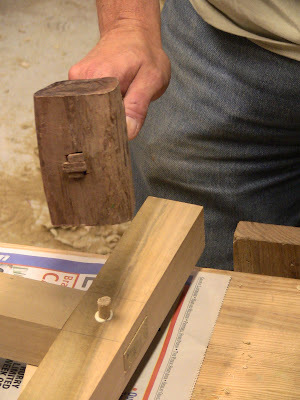 The gauge is set to the width of my 3/4" mortise chisel. Always gauge from the face side! 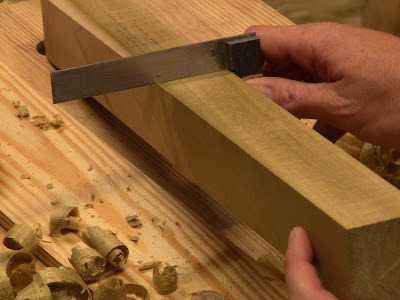 Gauging an upper rail for a lap joint (it'll be a half-lap on the leg). Always gauge from the face side! And did I mention? Always gauge from the face side! With the layout done, time to start cutting the joints. 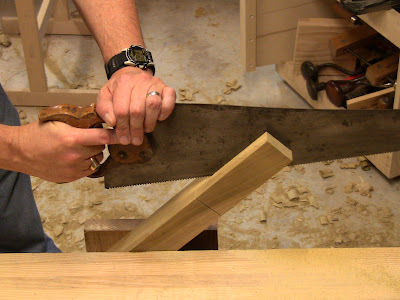 Sawing an upper rail shoulder. 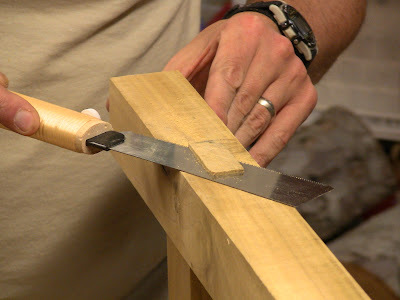 Sawing an upper rail cheek. Sawing the matching leg half-lap cheek. 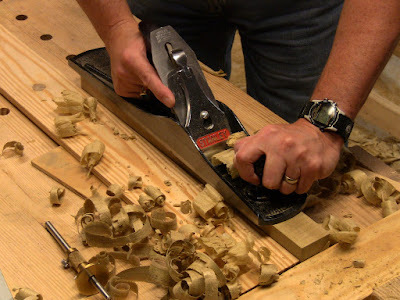 I started it with a back saw, then switched to my D-8 when that bottomed out. All the rips start by notching with a knife on the waste side of the line. 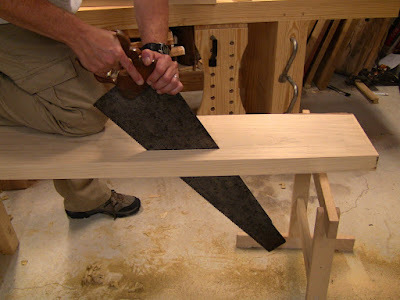 This makes for a precise start with the saw. 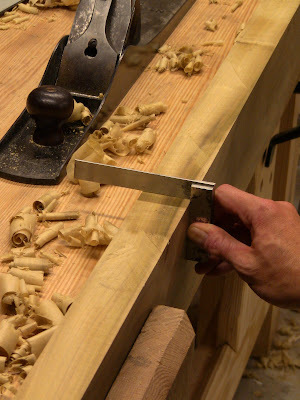 Cleaning up the sawn face by paring with a wide chisel. Next I drilled the holes for the drawbore pegs and screws. The upper rails are glued and screwed to the legs. 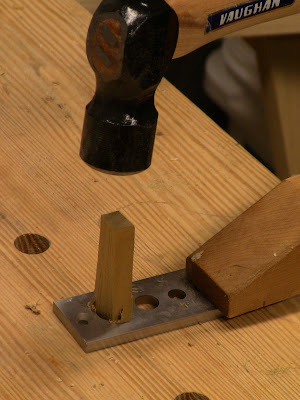 Proper assembly with screws requires pilot holes to prevent splitting. This isn't like attaching decking with self-drilling screws and a power driver. 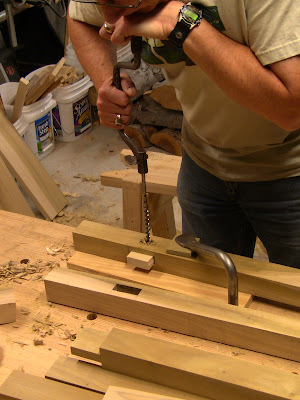 Drilling the leg mortise for drawboring. 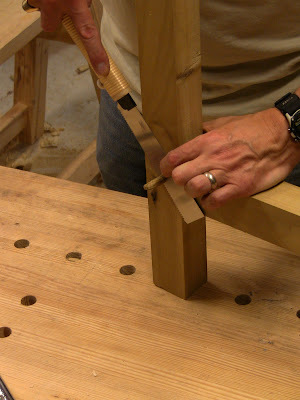 Drilling the peg hole in the lower rail tenon, offset toward the shoulder by 1/16". 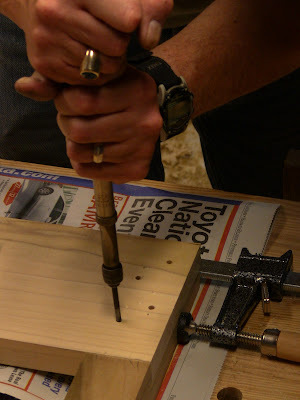 Using a Yankee push drill to make the screw pilot holes. A little quick honing of the bit cutting faces made it work better. Using the same bit in an eggbeater drill on the second leg assembly. 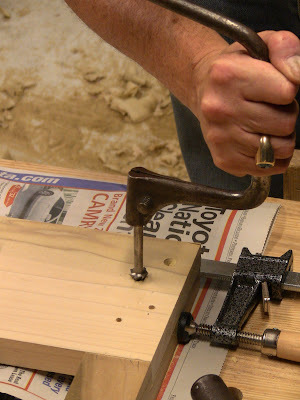 I had used this drill before, but it was kind of difficult. I noticed it was stiff even off the wood, so I put a drop of oil in each of the 3 oil holes. Voila! Complete transformation, zipped right through the holes. From annoying tool to preferred tool. Countersinking all the screw holes. The flukes on this bit fill with dust quickly, so a couple reverse rotations in each hole clear it to continue. After all this preparation, the joints went together fast. 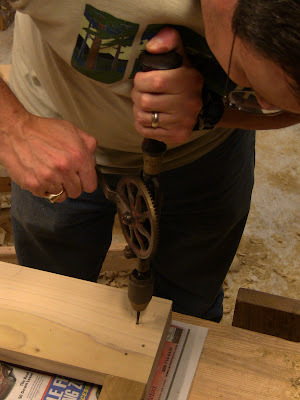 Using a Yankee driver to drive the screws. 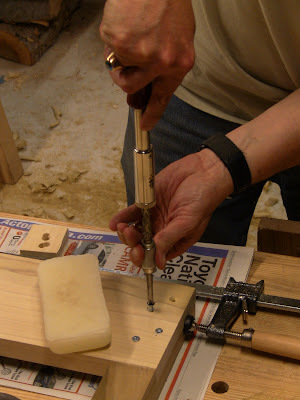 After dragging the threads on the white beeswax block, they go right in, as easy as using an electric driver. I completed the upper rail assembly by chucking a driver bit into a brace and using it to set the screws the last little bit. 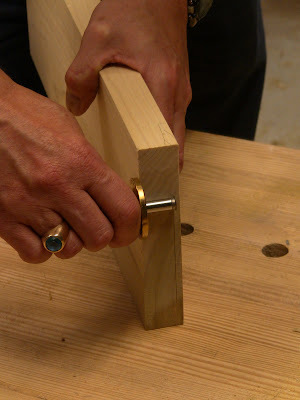 You need to be careful with this, the brace has so much leverage it can drive the screw right through without any effort, splitting the wood. I accidentally drove one down 1/8" deeper than I had countersunk the hole. Making a 3/8" drawbore peg by riving off some scrap, then driving it through 3 successively smaller holes in a dowel plate. This is noisy, so I wear hearing protection! Driving in the peg. 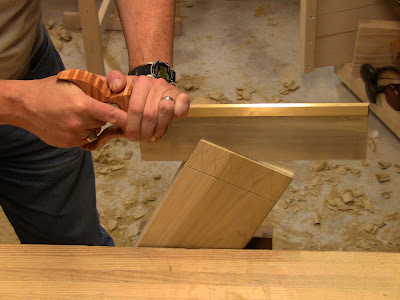 As it follows the path through the offset hole, it draws the joint up tight, as solid as the wood itself. This completes one leg assembly. Just need to trim things up. 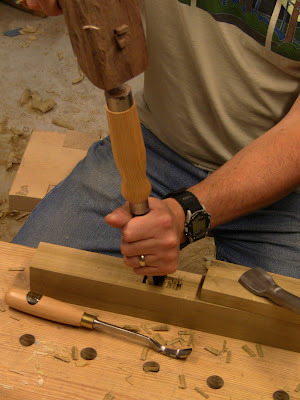 Trimming the ends of the through-tenons flush. The two leg assemblies completed, with spacer and battens resting on top. My through-tenons are still pretty ugly. Maybe after another 20 or 30 they'll be good. Next will be attaching the top. Look for a strance appearance of another Millers Falls #2 in a post hopefully this week. Yep! I was absolutely amazed at the difference 3 little drops of oil made on the #2. I also have a #77a and a Yankee 1530 which were a little stiff. I put a drop in each of the oil holes and cranked them a bit and they came to full life. Amazing! I've had that exact same experience. You've also got one of the models with the single pinion, making it significantly easier to turn. I've got both the dual-pinion and single-pinion versions, and it always seems like I have to mess around with the second pinion in the dual version to get it to turn smoothly. Unfortunately, I had to use the dual-pinion version in my recent, uh, modification that I've now finally posted because the chuck on my other one is too small. Wow, that portable bench is sweet! I honestly wish something like that was available commercially. 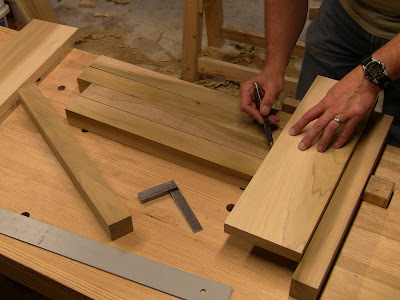 I'd like nothin' better than to build one, but how do you build a bench without a bench? That's one of the things Roy addresses on this project in his book. 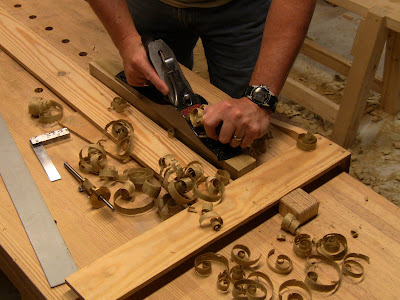 Paul Sellers does the same does as well for the workbench project in his book. Basically you have to do everything on the floor or on some type of temporary supports, like boxes, sawhorses, stools, tables, the edge of a porch, etc. 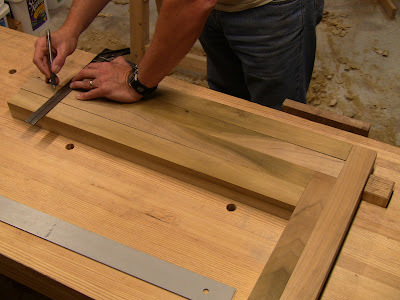 The work is pretty simple, even the joinery, so you can manage with a pretty crude setup (and dream of how much easier the work will be when you have a bench to work on!). Okay...I've gotta find a copy of that book then. Probably will have to be Amazon--the coastal plain of North Carolina is a desert when it comes to old tools. Love how ya adapted it work with no vises; hold fasts, bar clamps, Veritas bench dogs and a bench crook (oh my!) to eliminate the weight. It still probably isn't all that pleasant to lug any significant distance, but manageable for the most part. Thanks! The book is definitely worthwhile, though doesn't say a lot more than what I listed for working without a bench. "Portable" really just means luggable. You can get it into the back of a vehicle and transport it from location to location, up and down a few flights of stairs and through doorways, but that's all! It wheels around nicely on a dolly. My son does apartment maintenance and is constantly using buckets and cinder blocks as a makeshift bench so I'm building him a portable and foldable bench to take from building to building. This design is a great outline for the bench I'm about to start making for his birthday. 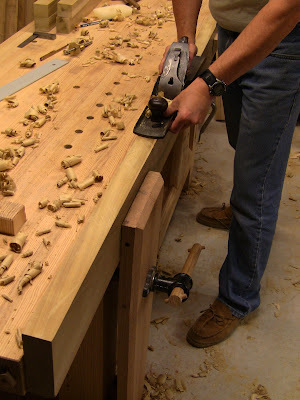 He, of course doesn't have the luxury of taking time to use hand tools for every job,but a nice folding bench will no doubt make life a bit easier for him. Somewhere there has to be a balance between stability and light weight and I think this is pretty darn close after modifications.